Ah, breakfast for dinner. This is indulgent enough for suppertime, served with some good sourdough, or a real treat for breakfast. If you can’t find creme fraiche, just substitute cream cheese, which is also awesome (so awesome, in fact, that I used to eat it by itself as a snack when I was a kid. I know). 1. In a smaller saucepan, melt the butter over medium low heat. 2. 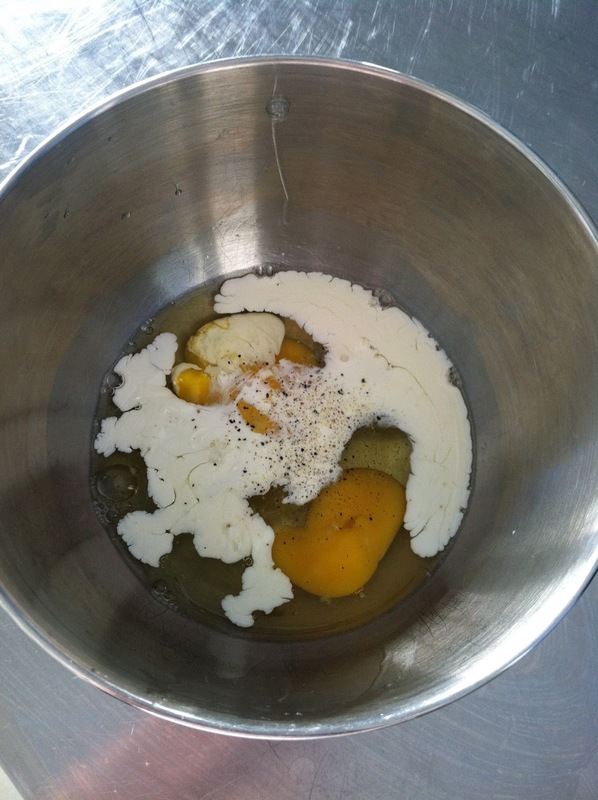 Whisk the eggs lightly together with the half & half (or cream), salt, & pepper. 3. 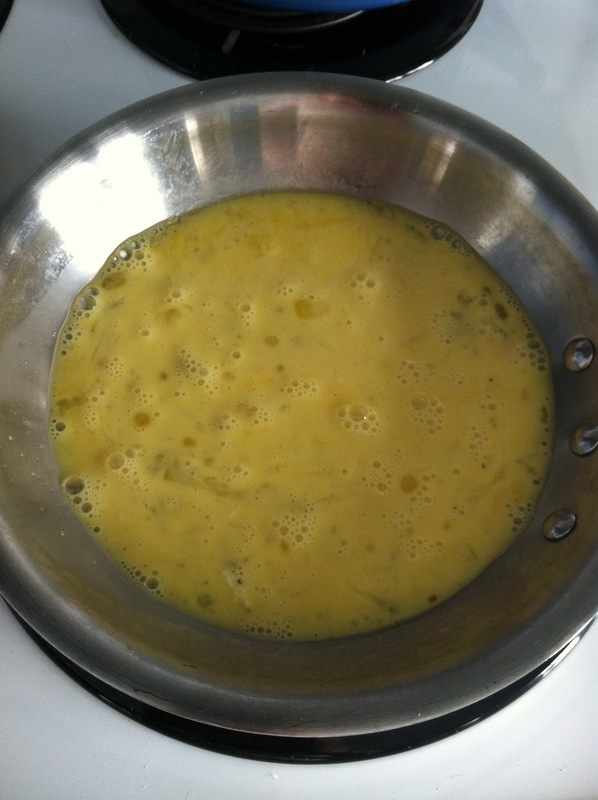 When butter is melted, pour the eggs into the saucepan. The key to cooking them is to use a wooden spoon, and kind of push the uncooked parts around the pan so they can get some heat, not letting the cooked parts stay on the heat too much. Keep a pretty close eye on these until they’re finished (approx. 5-7 minutes). You want them to be soft & creamy, not overdone. 4. 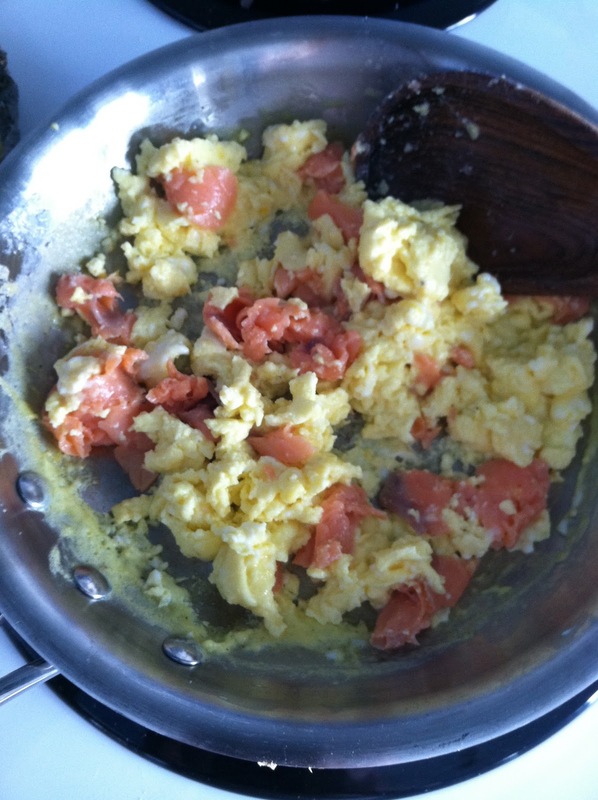 When eggs are almost finished, add salmon & stir to heat. 5. 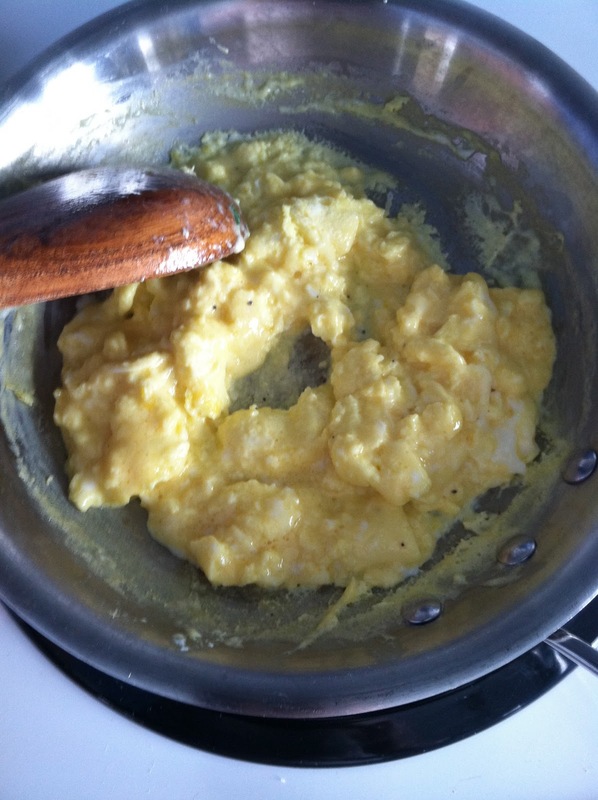 Remove eggs from heat, add the cream cheese or creme fraiche in little dollops, and stir to combine all of it. The heat from the eggs will melt the cream cheese a bit, which is perfect. 6. 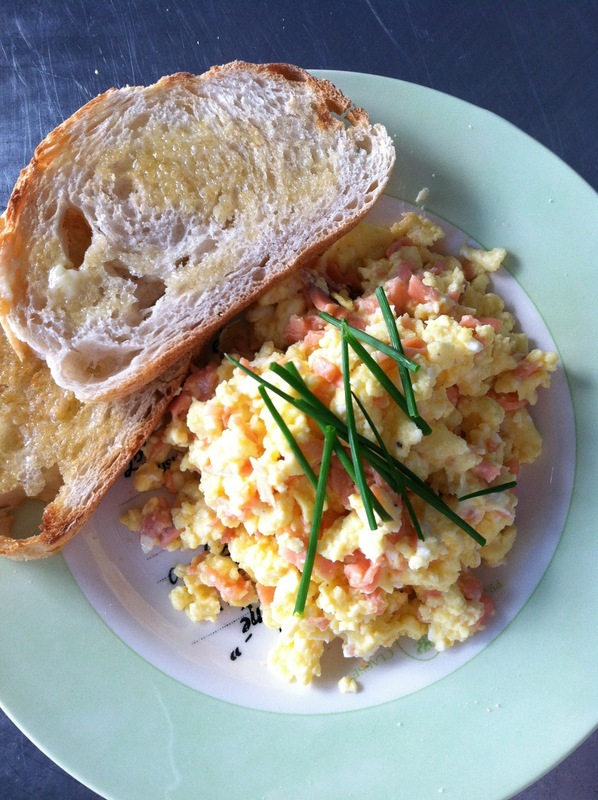 Top with torn chives. Serve with toasted buttered sourdough. — My new little indoor herb garden!!! I love springtime. This has been a really transitional 6 weeks or so, but the gorgeous new apartment and the new experiences – and cooking in the new kitchen! – are all helping, a lot. It’s a watershed moment in my life, and I’m really looking forward to everything that’s yet to come. 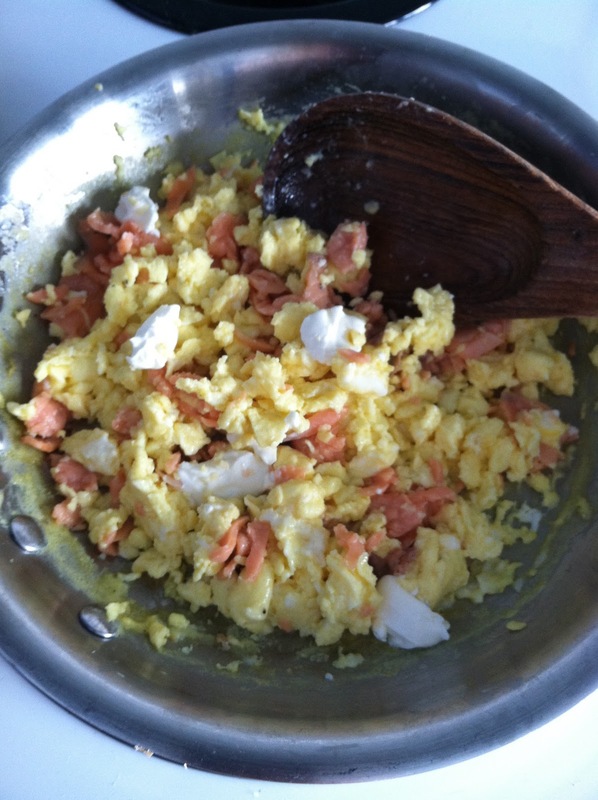 This entry was posted in breakfast, dinner, eggs, gluten-free, moving on, smoked salmon on April 29, 2013 by westyn.